In the video below, published by Tech Insider and titled “Elon Musk Shouldn’t Build Cities On Mars”, Hendrix talks about why Mars is not a great place for Humans and why we should colonize Titan instead. In September 2017, SpaceX CEO, Elon Musk revealed his latest aspirations for colonizing Mars. His plan is to send the first humans to Mars in 2024 to build the foundations for the first Martian city. But is Mars really the best place for humans to settle? 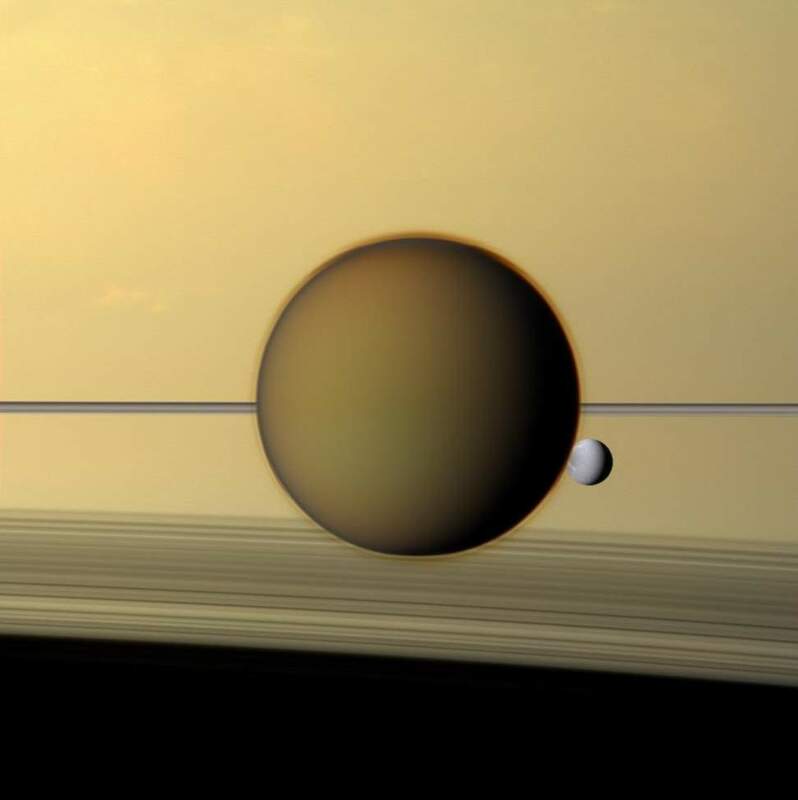 Some scientists, like Amanda Hendrix believes we should be looking somewhere else like Titan, a moon slightly bigger than our own that orbits Saturn. Hendrix is actually not too negative about Mars. She thinks we should go there, visit the planet and do science there. But she says Mars is not a good place for living for a long term. The main reason is radiation. Mars offers no natural protection against the solar radiation and galactic cosmic rays. Because, unlike Earth, Mars has a very thin atmosphere and no magnetosphere. So, humans who intend to spend any long period of time on Mars are probably going to live underground or some sort of devices that can shield them from radiation. It’s a moon, slightly bigger than our own. It has a solid surface. It has a dense atmosphere. There’s no other moon in the Solar System that has such an atmosphere. The atmosphere is mostly nitrogen. It’s about 1% to 2% methane. There’s no oxygen, but it’s not a big problem because there is plenty of water, H2O on the surface and in the sub-surface. So humans could make their own oxygen to breathe using water. With a radius of 2575.5±2.0 km, Titan is the largest moon of Saturn. It is slightly bigger than our Moon (around 1.4 times – the radius of Moon is 1737 km or 1079 miles). It is the only moon in the Solar System known to have a dense atmosphere. And, even more important, it is the only object in Solar System (and even in space, so far) other than Earth where clear evidence of stable bodies of surface liquid has been found. Titan’s atmosphere is denser than Earth’s, with a surface pressure about 1.45 atm (45% denser than Earth’s). That tick atmosphere shelters its surface from the galactic cosmic rays and solar radiation. What’s more, Titan spends 95% of its time within Saturn’s magnetosphere, which may help shield it from the solar wind. On the surface and in the atmosphere, there are vast quantities of hydrocarbons and complex organic chemicals in solid and liquid form. They can easily be used for energy. Cassini-Huygens, named after astronomers Giovanni Cassini and Christiaan Huygens, comprised both NASA’s Cassini probe, and ESA’s Huygens lander which would be landed on Saturn’s largest moon, Titan. Cassini released the Huygens probe on December 25, 2004, by means of a spring and spiral rails intended to rotate the probe for greater stability. It entered the atmosphere of Titan on January 14, 2005, and after a two-and-a-half-hour descent landed on solid ground. Cassini successfully relayed 350 of the pictures that it received from Huygens of its descent and landing site. Unfortunately one of the Cassini receivers failed due to a software error and caused the loss of another 350 pictures. Cassini’s numerous gravity measurements of Titan revealed that this moon is hiding an internal, liquid water and ammonia ocean beneath its surface. Huygens also measured radio signals during its descent that strongly suggested the presence of an ocean 35 to 50 miles (55 to 80 kilometers) below the moon’s surface. The discovery of a global ocean of liquid water adds Titan to the handful of worlds in our solar system that could potentially contain habitable environments and extraterrestrial life. On January 14, 2005, ESA’s Huygens probe made its descent to the surface of Saturn’s hazy moon, Titan. Carried to Saturn by NASA’s Cassini spacecraft, Huygens made the most distant landing ever on another world, and the only landing on a body in the outer solar system. This video uses actual images taken by the probe during its two-and-a-half hour fall under its parachutes. Huygens was a signature achievement of the international Cassini-Huygens mission, which will conclude on Sept. 15, 2017, when Cassini plunges into Saturn’s atmosphere. It’s really, really cold on Titan, around -180°C (-291°F), but thanks to its dense atmosphere, residents wouldn’t need pressure suits. Warm clothing and respirators would be enough. Walking or driving is not the way most transport would occur on Titan. The dense atmosphere and low gravity mean that walking would be clumsier than on Earth, and wheeled vehicles would find less traction and more air resistance. By contrast, flying would be so easy, that even human powered flight is possible. If Titan ever became a popular destination, congestion by flying bicycles, or flycycles may become a real problem. Plus, the view of Saturn from the surface of Titan would be GREAT. But there are a lot of problems too. First of all, Titan is so far way from Earth. We will still need faster propulsion even to go Mars. For Titan, the propulsion will have to be much faster, as the trip currently takes seven years. It is considerably more difficult to reach and colonize Titan than Mars. Titan also receives about 1% as much sunlight as Earth. Before sunlight reaches the surface, about 90% has been absorbed by the thick atmosphere, leaving only 0.1% of the amount of light Earth receives. 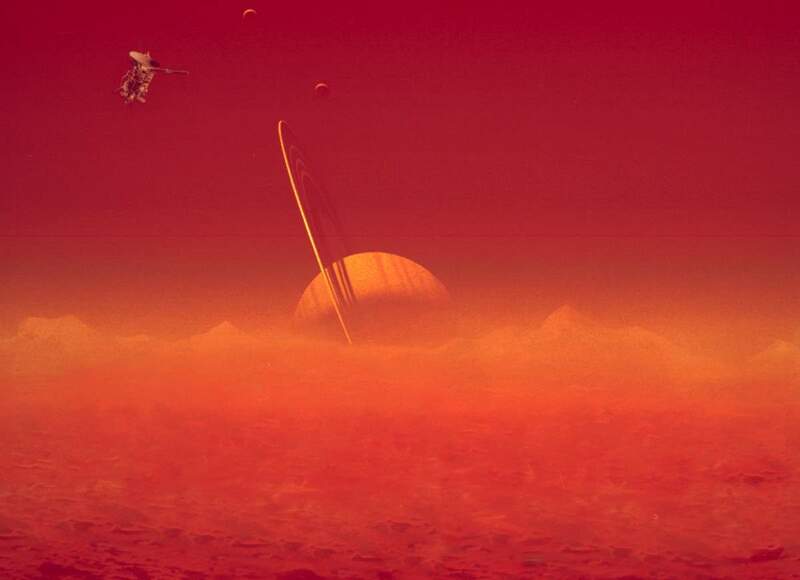 Artist’s rendition of Saturn viewed through Titan’s hazy atmosphere. Image: European Space Agency (ESA), Space in Images series. When I heard about Titan, I always recall Polish author Stanisław Lem’s 1986 novel named Fiasco. In the first, long chapter, which takes place in the future (a few hundred years from now), humans have colonized Titan and started doing mining business there. A young spaceship pilot Parvis sets out in a strider called Digla (a mecha-like machine) to find several missing people, among them Pirx (the spaceman appearing in Lem’s Tales of Pirx the Pilot). Parvis ventures to the dangerous geyser region, where the others were lost. Unfortunately, he suffers an accident. Seeing no way to get out of the machine and return to safety, he triggers a built-in cryogenic device. Titan is the scene of the prelude of the novel. A few hundred years more, a starship is built in Titan’s orbit, and sent to a distant star in order to make first contact with a civilization that may have been detected. Amanda R. Hendrix, Ph.D. is an American planetary scientist known for her pioneering studies of solar system bodies at ultraviolet wavelengths. She was awarded the Lew Allen Award for Excellence in 2006. She is a senior scientist at the Planetary Science Institute, a research institute founded in 1972 and based in Tucson, Arizona, focusing on planetary science. Her research interests include moon and asteroid surface composition, space weathering effects and radiation products. She is a co-investigator on the Cassini UVIS instrument, was a co-investigator on the Galileo UVS instrument, is a Participating Scientist on the Lunar Reconnaissance Orbiter LAMP instrument and is a Principal Investigator on Hubble Space Telescope observing programs.Before moving to PSI, Hendrix worked for 12 years at Jet Propulsion Laboratory in the Comets, Asteroids and Satellites Group. She was the Deputy Project Scientist for the Cassini-Huygens mission (2010-2012). Hendrix was a NASA astronaut candidate finalist in 2000.Hendrix received a B.S. in Aeronautical Engineering from Cal Poly, San Luis Obispo and an M.S. and Ph.D. in Aerospace Engineering Sciences from the University of Colorado Boulder.